[SatNews] Forget the days of no signals and slow signals—get ready for high speed on the high seas. A major technology investment by Royal Caribbean International gives guests aboard Oasis of the Seas and Allure of the Seas more wireless capacity than every other cruise ship in the world combined—the Wi-Fi will blaze at speeds that match or exceed what guests can achieve on land. By pairing a new generation of Medium Earth Orbit (MEO) satellites (originally designed to bring the Internet to emerging markets such as sub-Saharan Africa) with sophisticated antenna arrays aboard its newest ships, the popular ships are vaulting competitors and delivering guests the kind of technology they expect in a connected world. 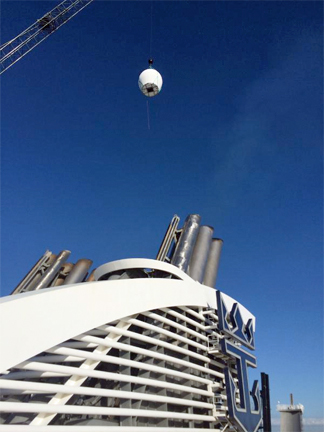 A set of new, custom-built antennae were shipped from Israel to Florida last month, and installed on Oasis of the Seas. Testing confirmed the ships' ability to match the fastest broadband connections on shore. "O3b, our satellite communications partner, calls it 'fiber speed with satellite reach,' and this is exactly the result we are seeing in our tests," said Bill Martin, Chief Information Officer, Royal Caribbean Cruises Ltd. According to Martin, the key to unlocking a land-like experience was reducing satellite latency—the time it takes for something to happen after you hit 'enter.' This breakthrough technology solves that problem, reducing latency from 750 milliseconds to approximately 140 milliseconds. With each ship's overall capacity exceeding 500mbps during system tests, there will be more than enough bandwidth to go around. Said Goldstein, "If you're a first-time guest on one of these ships, you won't realize how much work it took to make the wireless so pervasive—or that your cell 'tower' is 4,900 miles over your head. If you are a return guest, you'll be blown away by the improvement. It's that dramatic." For the first time, he said, it will be feasible for a guest to download streaming video or post video clips to Facebook. The company is developing new pricing plans for added service.